The FUJINON XF60mmF2.4 R Macro lens is designed with 10 lens elements arranged in 8 groups including one extra low dispersion element (the 6th element of the lens) and one glass molded aspheric element (7th element). The 60mm focal length range of the lens is roughly the equivalent of that of a 90mm lens on a 35mm camera (crop factor of 1.52x). The lens has an angle of view of 26.6˚. The diaphragm of the lens is built with 9 beautiful rounded blades. The maximum aperture offered is f/2.4 while it can stop down to f/22. 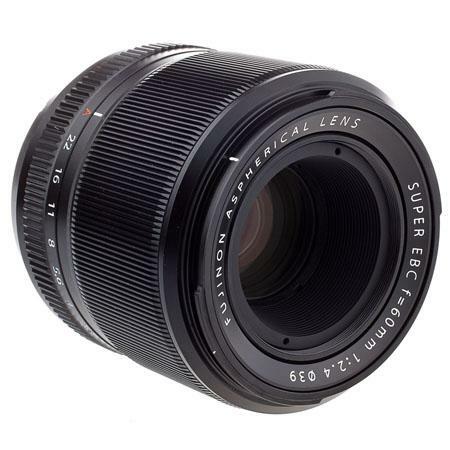 Although Fuji demarcates this lens as Macro it has a reasonable short focusing distance of 0.88’ or 0.267 meters giving a maximum reproduction ratio of 1:2. Though it has been pitched for macro photography the FUJINON XF60mmF2.4 R Macro is a great portrait lens. The wide f-stop of f/2.4 is perfect for soft out of focus background (or foreground) in your portrait shots (also known as bokeh). The low light performance of the lens is quite good while lens fall-off is virtually suppressed even when shooting wide open at f/2.4. The overall build quality of the lens is excellent. It is made of anodized aluminum with the lens marking engraved into the metal surface and then painted to fill. The external dimensions of the lens are 64.1mm x 70.9mm and it weighs approximately 215 grams. The filter specifications are 39mm. It comes bundled with a lens hood made of anodized aluminum with plastic bayonet.